Within offshore wind energy, or perhaps even all renewable energy, floating wind turbines are the future. As a meteorologist in Bergen, Norway, I'm fortunate to be in the country at the forefront of development for this industry. As renewable energy was also the topic of my PhD thesis, I have a great interest in this emerging technology. With the expertise our country has gained from our heavy involvement in the oil & gas industry, we are well-positioned to become early market leaders. One reason for this push in development is that any wind farm in Norwegian waters will have to be floating, due to the depth of the ocean off our coast. When waters are shallower, turbines can be connected to the sea floor. Deeper waters mean the foundations must float — a more complicated solution but better for the ocean's ecosystem. We therefore have a strong vested interest in this technology. Due to the high cost involved, Norway is one of only a handful of countries that have been able to properly develop floating turbines. While it will probably take another ten years to solve the economic, technical and environmental challenges around these structures, we are well on our way. Experts foresee offshore wind growing by more than 20 percent each year over the next several years, and floating wind farms will open up completely new growth opportunities. Since 2007, single prototypes have been installed off the coasts of Norway, Italy, Portugal, Sweden, Japan and the United States. The first floating turbines began operating in the North Sea in 2009, where in 2017, the first fully-operational floating wind farm, Hywind Scotland, was installed 25 km off the coast of Aberdeen. StormGeo supplied advanced weather forecasts during the installation of Hywind and continues to support it with daily point forecasts. With StormGeo’s Offshore Wind Metocean Web Portal, offshore wind farms can see a map with their locations, overlaid on forecast charts that can be animated up to 10 days in advance. These forecasts provide weather windows for all operations as well as lightning warnings and tidal information. Developed by Norwegian oil and gas company, Statoil (now Equinor), Hywind has six floating turbines with a total capacity of 30 MW. Relative to its size, the farm has produced very well and proved stable enough to withstand strong winds and storms. At maximum capacity, Hywind’s turbines can produce enough energy to power 20,000 homes at once. Experts foresee offshore wind growing by more than 20 percent each year over the next several years, and floating wind farms will open up completely new growth opportunities. The global market has enormous potential and will allow companies to harvest wind power from much larger areas of the ocean than just along the coast. In other regions of the world, such as the U.S., Asia and the Middle East — where wind energy is generating a lot of excitement — our experience will be a huge advantage in developing new projects. In some of these regions, such as the steeply-shelved coastlines of the U.S. West Coast, the Mediterranean and Japan, floating foundations are the only option. In fact, nearly 80% of the ocean’s potential for offshore wind is in deep waters. Thus, the future is almost completely reliant on floating turbines. Apart from the time and expense it takes to develop floating turbine technology, there are additional technical challenges. Mounting these massive steel structures, which can measure up to 200 meters, is costly. They need anchors and chains weighing several tons and, if they are to operate in a harsh climate such as Norway’s, extremely strong equipment. Figuring out how to minimize movement in a floating structure is also a challenge. If waves cause the turbines to move too much, efficiency goes down. One answer to this is to keep in mind that wind is more stable on the open sea than near the coast. Another demanding issue with floating turbines is the cost and difficulty of maintenance. Being far out at sea, where waves are higher, they can be difficult to access. The other major challenge is environmental. A turbine’s blades sweep through a large area, creating a potential hazard for birds. This means that farms cannot be placed in areas where there are large bird migrations. This is a big issue in Norway, as many places along the coast contain bird migrations. We are working closely with environmental organizations such as the Norwegian Ornithological Society to create solutions that will not negatively impact an area’s ecosystem. Traditional wind farms remain and always will be important, but floating turbines will take our current generation of wind energy to the next level. With an increase in global investment and collaboration, technology is beginning to create solutions that will continue to drive down costs and improve efficiency. 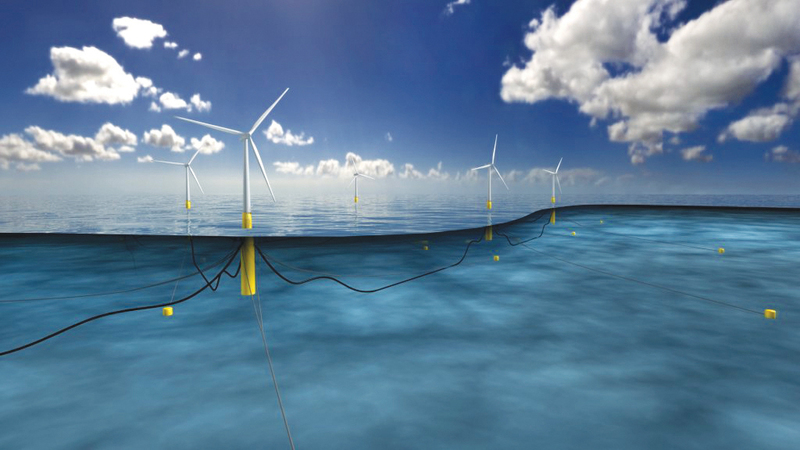 Equinor has said that by 2030, it hopes to bring the cost of floating offshore wind down to $50–74 per MWh. 2018 saw an overall decrease in the cost of renewable energy, dipping below the cost of fossil fuels for the first time. The potential for floating farms, and thus all wind energy, will continue to grow alongside solutions for other renewable energy sources. We’ve already seen a steady improvement in solar cell technology and some countries are looking into harnessing tidal energy. Meanwhile, the U.S. is anticipating a huge surge in wind energy. Suffice it to say, this is an exciting time to be part of the renewable energy wave!